The most common source of all issues under saddle is imbalance. Regardless of breed or discipline, practically every rider strives towards helping their horse shift their weight off of the forehand and work in balance and self-carriage. As practically any rider will tell you; this is easier said than done. The Tellington TTouch Balance Rein is a deceptively simple but effective tool that helps horse and rider softly achieve harmony and Balance. The Balance Rein can be used with any bridle and acts like a second rein except that it lies around the base of the horse’s neck instead of coming from the bridle. A light pressure at the base of the neck helps remind the horse to shift weight up and back through the withers while maintaining length through their neck. For years many people have used a neck strap or stirrup leather when teaching beginners to jump. Linda has designed a balance rein that combines a rein – for ease of holding and a rope to give a broader contact on the horse and weight to help it hang in place. The Balance Rein sits at the base of the neck and is held as a second rein. The proportional contact on the Balance Rein and the bit can be 50/50; 60/40 or 40/60. The light pressure on the base of the neck helps to trigger the ‘seeking reflex”, a passive muscle which encourages the withers to lift and the neck to telescope from the withers to the poll. The seeking reflex is the third part in the ‘ring of muscles’, which must be activated to achieve engagement. This is very helpful for horses who have a tendency to brace at the base of the neck. The Balance Rein should not be held against the horse’s neck with steady contact or it may invite the horse to lean or brace more. 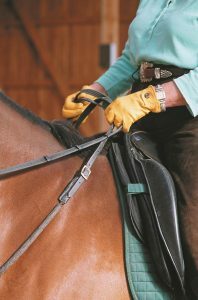 Having one to three fingers in between the balance rein and bit rein will allow you to differentiate the use of the reins. Use the balance rein with an ‘ask and release’ signal in a slightly diagonal direction following the angle of the horse’s shoulder, rather than a backward direction – the re-balance comes on the release not the ask. Linda demonstrates how to hold the Balance Rein with your regular reins.